This hotel is 100 pct non smoking. 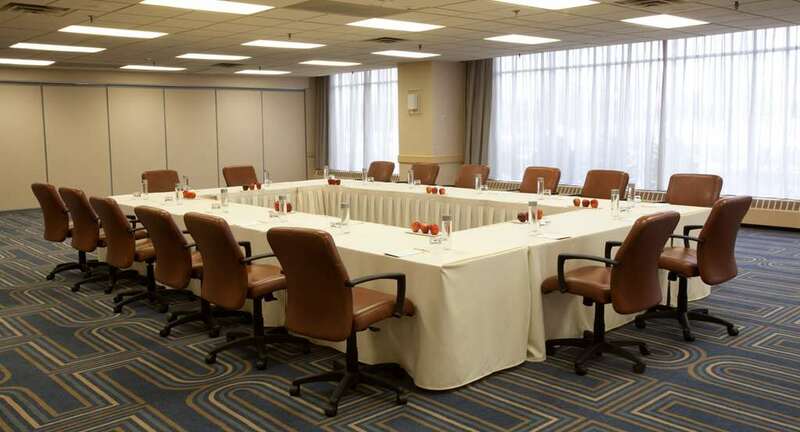 Conveniently located in the heart of Bloomington the DoubleTree by Hilton Bloomington-Minneapolis South Hotel is located just ten minutes from the Minneapolis/St. Paul International Airport in Minnesota. Our Bloomington hotel is buzzing with business traffic during the week and in close proximity to area office towers. On weekends shopping guests make forays to the nearby Mall of America. Offering complimentary van transportation to the airport Mall of America and offices and restaurants within a 5-mile radius of our hotel you*re sure to find convenience and comfort while staying with us based upon availability at the time of your reservation request. Crescent Kitchen: Crescent Kitchen features regional American fare comprised of familiar comfort foods updated refined for the modern diner*s palate focusing on shareable small plates which encourages groups to socialize in a convivial atmosphere. Daily Brew: In the morning don*t forget to start your day off right with a cup of hot coffee from Starbucks and a breakfast item at the Daily Brew serving light fare on the lobby level. Sit down with a snack or grab something to go before your big meeting. Crescent Kitchen Bar: Crescent Kitchen Bar features 16 craft beers selections on tap along with a selection of small batch bourbons and scotches. Select a signature cocktail or choose a wine from vineyards around the world.